I'm starting an aquatic life theme in the speech room, thanks to Pierre the Penguin and his awesome influence! I decided that Sharks are quite possibly the most interesting, yet terrifying, aquatic being that would capture my kiddos attention. SO, I created this packet, and did some extensive internet searching, to bring you the Shark Week of Speech! You'll find a KWL chart in here to start off with. I have my kiddos bullet these to cut down on the amount of writing. In the end, your kids will make a story about their own Shark and have a nice packet behind it to show their work. I've been reading my blurb aloud to students depending on what level they're at, and then having them fill in their note-taking graphs. For my stronger readers, I've been having them do the reading and then working on extracting information. When we're done, I try to get them to fill in as much information as they remember, and use peer input to help! You can then move on to the coolest part (I think) of this activity - the Shark cam! Click here for the link to this great live video of a Shark reef! Have the students make observations about the sharks, and get ideas for their sharks! Then, it's time to create. 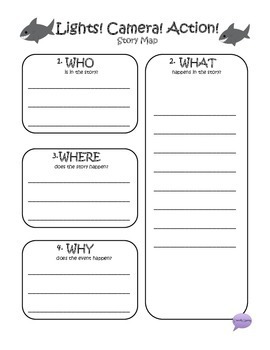 Have students use their story map and character chart to start their story. Use the rough draft as your sloppy copy, and then make corrections with peer and clinician review. Put the final work together, and draw a picture of your shark as your cover! The younger kiddos can draw a photo of their shark and write minimal details about it (name, what it eats, what it likes). There's carryover involved in this packet too, some simple questions and vocabulary. Oh! There are vocabulary cards as well! Forgot to mention that one! Download this here on TpT for FREE for a limited (meaning til Weds) time!